The great T�miscamingue region offers a superb hunting area due to its thousands of acres of woodland. This perfect hunting environment has given the T�miscamingue region a lot of notoriety. 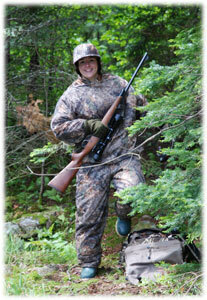 The Camp Lalucarne outfitter gives you access to this wonderful hunting region abundant with moose and small game. Any interested hunter is therefore welcome to zone 13. As statistics done by Minist�re des ressources naturelles et faune du Qu�bec have shown, on the 29 different hunting zones in Québec, zone 13 has been, for many years, second regarding the number of moose bags. 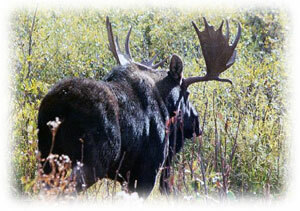 Fall Moose Hunt with rifle or bow, $750.00 CDN per person for 7 nights and 6 days. As soon as you arrive, hunters will be given a tour of their cabin, the site premises and hunting area. A hunting stand is then assigned to each hunter. The following morning the hunt begins! Due to its high moose population, zone 13 region only requires 2 permits per game. Furthermore, hunters are also given a boat with motor to fish during their free time. Hunting and fishing licenses are not included. An American Plan is available upon request for $65.00 per day; includes breakfast, lunch and dinner. Deposit of $200 per week is required upon reservation, balance is due upon arrival. Deposits are non refundable or transferable. We give fair exchange on US currency via set daily rate as these rates are subject to daily changes. 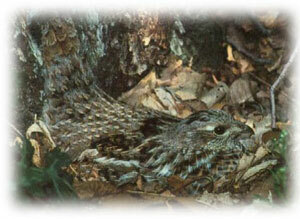 People who enjoy small game are also invited to come for a stay at the outfitter to practice their sport. The Canadian Shield�s autumn nature offers, year after year, a landscape as well as colors that take your breath away. The easy access to forest trails where small game is located facilitates the detection of these animals while offering you a superb hike. Great activity to practice as a couple or with friends!